We are really far behind with blogging. Steve hasn’t been feeling very well. We don’t know what is wrong with him, but he’s just not himself. He doesn’t like to be touched and has started refusing to jump off the bed. Mom is taking him to the vet again tomorrow to see about getting x-rays of his hips and back. So instead of blogging, Mom sits around and loves on Steve and then reads her vet book to try to diagnose Steve. She thinks he has every ailment in the entire book at this point. Anyway, last time we blogged, we said we would tell you about Dad’s birthday. We gave him a card and some Kit Kats. Earlier in the month he got a new Xbox 360 because his old one broke, so he got his present early. 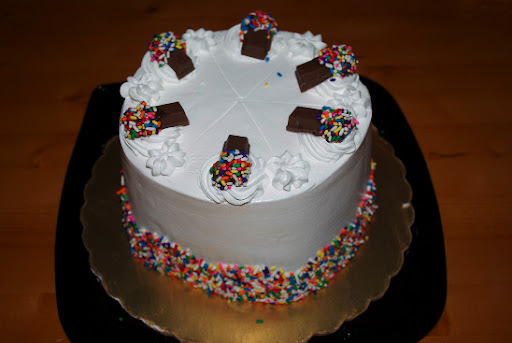 Dad also got this yummy looking cake from Cold Stone Creamery. A few days before Dad’s birthday, our Texas grandma sent us some special cookies and we saved them to eat on the big day. 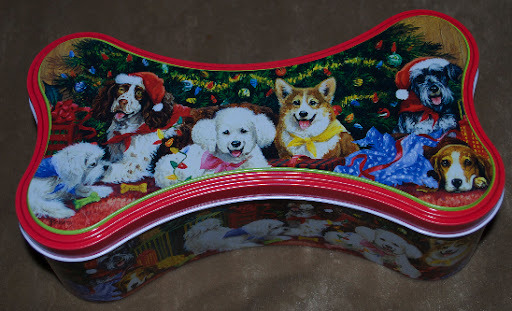 The cookies were in this tin. The cookies looked like this. The Texas A&M football helmet is for Steve and the orange leaf is for me. The store didn’t have any OSU helmets, but I liked the orange leaves with sparklies. 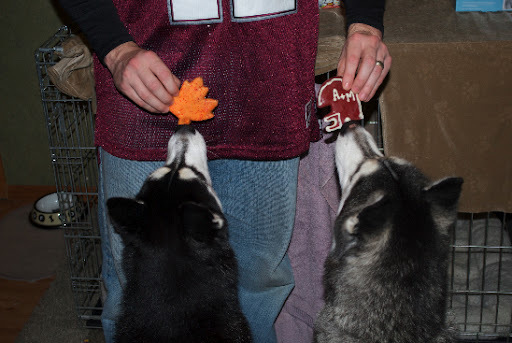 Since it was Dad’s birthday, he got to pass out the cookies. We got nose-to-cookie and boy, they smelled yummy. Right after that picture was taken, we got to eat the cookies and I can tell you, they tasted as good as they smelled and looked! 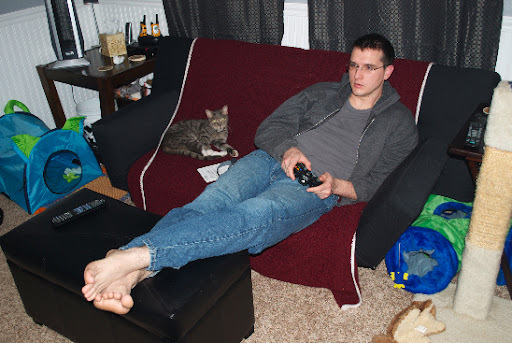 Dad got a new game for his Xbox 360 from our Missouri grandparents and Wilbur helped him try it out. Note: Mom says not to look too closely at that room because it’s Dad’s man room, which he shares with Wilbur, so she lets Dad be messy up there. So as you can see, we all helped Dad celebrate his birthday! Dec 15 Happy Graduation to me!